The police response to a hotel disco crush that killed three teenagers in Northern Ireland has been referred to the Police Ombudsman. It has emerged that the first officers who arrived at the scene of the tragedy withdrew to await support. Students Lauren Bullock, 17, Morgan Barnard, 17, and Connor Currie, 16, died after a crush at the Greenvale Hotel in Cookstown on St Patrick’s Day. PSNI Chief Constable George Hamilton has referred the actions of the police officers who first responded to the emergency call to Ombudsman Dr Michael Maguire for investigation. Deputy Chief Constable Stephen Martin announced the move, saying: "The first police officers arrived at the hotel grounds shortly after receiving the 999 report. "Following their initial assessment they made attempts to establish more detail and information about what was happening and subsequently withdrew to await further police support. When the first ambulance arrived police moved forward in support of them. "The timing and nature of police actions during this period require further investigation to fully establish the facts. "The Chief Constable has therefore decided that the initial police response should be subject to independent scrutiny and it is in the public interest to refer the circumstances and the nature of the actions of the first officers arriving at the scene to the Police Ombudsman." Mr Martin said the families of the three victims had been informed of the referral. 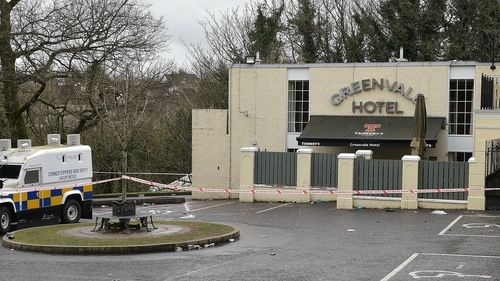 "The ongoing investigation into the tragic events at the Greenvale Hotel is active and wide-ranging," he said. "As part of that investigation, it is right and proper that the actions of all those involved are considered. "Part of the investigation has included a review of the initial police response." He added: "The confidence of the families and the confidence of the communities we serve are at the forefront of our minds in our decision to refer this matter to the Police Ombudsman. "We will work with the ombudsman to support whatever action he undertakes and would ask that people do not speculate or prejudge the outcome of the ombudsman's investigation."